Oculus announced a brand new set of wireless VR goggles last night, this time in the form of the Oculus Quest. Before you start thinking, ‘Hang on a sec, this is just another one of those Oculus Go mobile-type gubbins, isn’t it?’, bear with me. 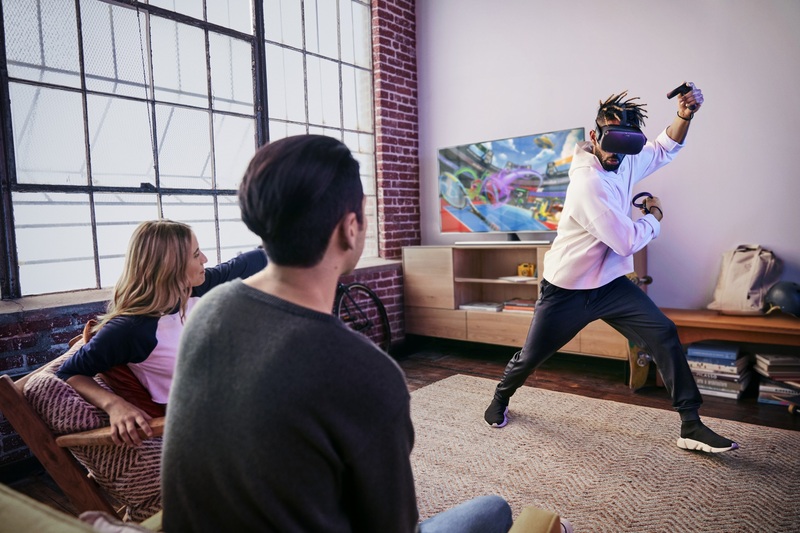 For unlike the Oculus Go, the Oculus Quest offers the same hand-tracking Touch controllers you get with the Oculus Rift proper, as well as the same six degrees of free movement you get on Rift, all without the need for a PC, wires or external motion sensors. It’s almost like this is what VR headsets should have been like when they first came out two and a bit years ago, isn’t it? Here’s what we know so far. Priced at $399 and arriving in Spring 2019, the Quest is being dubbed Oculus’ “first all-in-one VR gaming system”, despite them already calling the Oculus Go their “first all-in-one wireless headest” almost a year ago. However, whereas the Go was more akin to the mobile-based Samsung Gear VR headset, the Quest thankfully has much more in common with their grown-up Rift headset. For starters, it comes bundled with a pair of Oculus’ hand-tracking Touch controllers in the box for all your VR waggle needs, and works with largely the same kind of games that are available on Rift as well, including nifty robot shooter Robo Recall and cutesy mouse adventure Moss. The Quest isn’t merely a wireless version of the Rift, though, as it does all this without any need for additional motion sensors to keep track of the Touch controllers. This is thanks to Oculus’ new ‘inside-out tracking system’ Insight, which uses four ultra-wide angle sensors built into the headset and various bits of algorithm magic to track your position in real time. It can also power Oculus’ spatial awareness Guardian system as well, which displays all those handy wall and floor markers whenever you stray too close to the boundaries of your play space. How often you’ll actually see any of those with the Quest remains to be seen, however, as Oculus are touting that their Insight tech will allow people to “go beyond room-scale” experiences, providing a greater sense of immersion, presence and mobility at the same time. I’m not exactly sure what going beyond room-scale VR actually entails at this point (park-scale VR? City-scale VR? ), but I’m sure that having the same, superior 1600×1440 per-eye resolution lenses as the Go will only help matters when it comes to the old enhancing immersion part of the deal compared to the Rift’s 1200×1080 per-eye resolution. The Quest also has improved built-in audio with deeper bass, according to Oculus, as well as lens spacing adjustment for maximum comfort. It doesn’t look like the Quest will share exactly the same library of games as the Rift, however, as Oculus have said there are currently 50 games lined up for launch next year, including the newly-announced, exclusive episodic Star Wars story series Vader Immortal: A Star Wars VR Series from ILMxLAB, with more Rift favourites such as the aforementioned Robo Recall and Moss to come further down the line. Whatever happens, you’ll only have 64GB of space to play with when it comes to storing games on the headset, so you’ll no doubt have to do regular clean-ups to make room for more stuff. Will it be worth cutting the cords for on-the-go VR, though? With the Oculus Rift + Touch bundle now also priced at £395 / $399, I’m not entirely sure what’s better: faster-running games that might also break my neck, or what’s essentially the VR equivalent of a Nintendo Switch? Given my affection for the latter, I’d probably side with the Quest if Oculus hadn’t also gone and said that its introduction has now “completed our first generation of best-in-class VR headsets”, as that just makes me even more intrigued for what’s coming next. Is there an Oculus Rift 2.0 round the relative corner? In truth, it will probably be at least another year before Oculus announce another headset, but part of me would rather wait and see what the deal is with Oculus’ second generation of VR headsets than jump straight in with the Quest come spring time. Only time will tell what else Oculus have up their sleeve, of course, but for now, the prospect of a Switch-like VR headset is very tempting indeed. Tagged with Hardware, Oculus, Oculus Quest, virtual reality, VR.